Short bio: Keryn Lian is Professor and the Director of Flexible Electronics and Energy Lab at the Department of Materials Science and Engineering, University of Toronto. She graduated in polymer Materials Engineering from Shanghai Tongji University, obtained her M.Sc in Electrochemistry from University of Calgary, and PhD in Materials Science from University of Toronto. Professor Lian’s research interest is on novel materials to enable light‐weight, thin, and flexible solid energy storage and electronic technologies. Her group has been developing advanced biomass carbon materials, pseudocapacitive materials to modify carbon electrodes, high performance proton‐conducting, hydroxide ion‐conducting neutral‐salt and ionic liquid conducting polymer electrolytes as well as their applications in supercapacitors and other flexible electronics and devices. 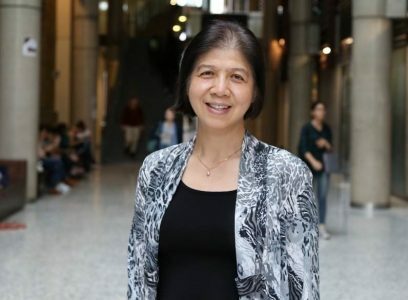 Prior to UofT, Dr. Lian was a distinguished member of the technical staff and Manager at Motorola Labs, where she conducted and led research in energy storage, RF‐Micro-Electro-Mechanical Systems (MEMS), microfluidics with advanced printed wiring board (PWB) technologies. She has published over 115 papers in refereed journals and conference proceedings and holds 35 US patents. She is an editorial board member of ACS Applied Energy Materials, a member of the Education Committee of the Electrochemical Society (ECS) and a board member of the International Academy of Electrochemical Energy Science (IAOEES). The electrochemical capacitor (EC) is an important energy storage technology for high power and fast energy deliveries. Our research in EC covers electrode modifications, polymer electrolytes development, and cell assembly and characterization. In terms of electrodes, we are focusing on chemical modifications of porous and nonporous carbon materials to add pseudocapacitance for enhanced energy density and conductivity. As for electrolytes, we are investigating polymer proton conducting electrolytes for ECs which can greatly improve the volume energy and power density with very thin form factors. The thin cells are combined with batteries or solar cells to form hybrid energy devices for prolonged fast energy delivery and for self-powered energy devices. Printed large area flexible electronics could drastically change the future electronics surrounding our daily lives. Our research is to add memory functionality to current printed electronics. We are developing a simple crossbar memory on flexible plastic substrates through deposition of conducting, semiconducting, and insulating inks via solution deposition and screen printing processes. The semiconducting ink has a bistable characteristic which can switch the impedance from high (“Off” state) to low (“On” state) with an On/Off ratio up to106. Both write-once-read-many times (WORM) and rewritable memories have been demonstrated with various organic molecules. Our approach provides a high throughput and low cost solution for devices such as printed RF-ID, smart packaging or intelligent posters. M.Genovese and K.Lian, “Ionic Liquid Derived Imidazolium Cation Linkers for the Layer-by-Layer Assembly of Polyoxometalate-MWCNT Composite Electrodes with High Power Capability”, ACS Appl. Mater. Interfaces. 8(29), pp19100–19109, 2016. H.Gao and K.Lian, “A H5BW12O40-polyvinyl alcohol polymer electrolyte and its application in solid supercapacitors”, Journal of Materials Chemistry A. 4, 9585-9592, 2016. H. Gao, J. Li, J. Miller, R. Outlaw, S. Butler, and K. Lian “Solid-state electric double layer capacitors for ac line-filtering”, Energy Storage Materials, 4, 66–70, 2016. M. Genovese, Y. Foong and K. Lian, “The unique properties of aqueous polyoxometalate (POM) mixtures and their role in the design of molecular coatings for electrochemical energy storage”, Electrochimica Acta, 199, 261–269, 2016. J. Chang, A. Huzayyin, K. Lian, and F. Dawson, “Quantum Capacitance of Graphene in Contact with Metal”, Applied Physics Letters. 107(19):193902, 2015. H. Gao, A. Virya and K. Lian, “Proton conducting H5BW12O40 electrolyte for solid supercapacitors”, J. Materials Chemistry A. 3(43), 21511-21517, 2015. M. Genovese and K. Lian, “Polyoxometalate modified inorganic-organic nanocomposite materials for energy storage applications: A review”, Current Opinion in Solid State & Materials Science, 19, 126-137, 2015. M. Genovese, J. Jiang, K. Lian and N. Holm, “Capacitive Performance of Exfoliated Biochar from Biomass Waste Corn Cob”, Journal of Materials Chemistry A, 3, 2903 – 2913, 2015. H. Gao and K. Lian, “Proton-Conducting Polymer Electrolytes and Their Applications in Solid Supercapacitors: A Review”, RSC Advances, 4(62), 33091-33113, 2014. H. Gao and K. Lian, “A Comparative Study of Nano-SiO2 and Nano-TiO2 Fillers on Proton Conductivity and Dielectric Response of a Silicotungstic Acid–H3PO4–Poly(vinyl alcohol) Polymer Electrolyte”, ACS Appl. Mater. Interfaces. (6)1, 464-472, 2014. H.Wu, M.Genovese, K.Ton, and K.Lian, “A comparative study of activated carbons from liquid to solid polymer electrolytes for electrochemical capacitors”, J.Electrochemical. Soc., 166 (6), A821-A828 2019. J.Li, H.Gao, J.R. Miller, R.A Outlaw, S. Butler, K. Lian, “Study of Solid Alkaline Electrolyte under High Temperatures and Its Application in Electrochemical Capacitors for AC Line-Filtering”, Journal of Power Sources, 417, 145-149, 2019. H.Wu, J.Rosas and K.Lian, “A study of Bending Properties of Solid Electrochemical Capacitors”, Journal of the Electrochemical Society, 166(2), A15-A20, 2019. J. Li and K. Lian, “Investigation of Hydroxide Ion-Conduction in Solid Polymer Electrolytes via Electrochemical Impedance Spectroscopy”, Electrochimica Acta, 288, 20, 1-11, 2018. M.Genovese, H.Wu, A.Virya, J.Li, P.Shen and K. Lian, “Ultrathin all-solid-state supercapacitor devices based on chitosan activated carbon electrodes and polymer electrolytes”, Electrochimica Acta, 273, 392-401, 2018. B. Ao, Y. Wei, M. Wang, Y. Cai, K. Lian, Jinli Qiao, “High performing all-solid electrochemical capacitor using chitosan/poly(acrylamide-co-diallyldimethylammonium chloride) as anion conducting membranes”, Electrochimica Acta, 2018. J. Li and K.Lian, “The effect of SiO2 additives on solid hydroxide ion-conducting polymer electrolytes: A Raman microscopy study”, Physical Chemistry Chemical Physics, 20, 7148-7155, 2018. A.Virya and K.Lian, “The Role of Ion Hydration in the Performance of Li2SO4-Polyacrylamide Electrolyte Systems: Material Characterizations Under Real-Time Conditions”, Journal of Physical Chemistry C, 122(4), 1939-1945, 2018. Y.Foong, D. Kirk, K.Lian and S.Thorpe, “Borotungstic acid – polyacrylamide solid electrolytes for electrochemical capacitors with H3PO4 plasticizer”, Materials Science and Engineering B, 229, 96-104, 2018. H.Wu and K.Lian, “Aqueous Based Asymmetrical-bipolar Electrochemical Capacitor with A 2.4 V Operating Voltage”, Journal of Power Sources, 378, 209-215, 2018.